The heavy logs were moved on skids. The driver tried to take the corner too fast and the car went into a skid. The truck skidded on the icy road. The team skidded, losing its last five games. 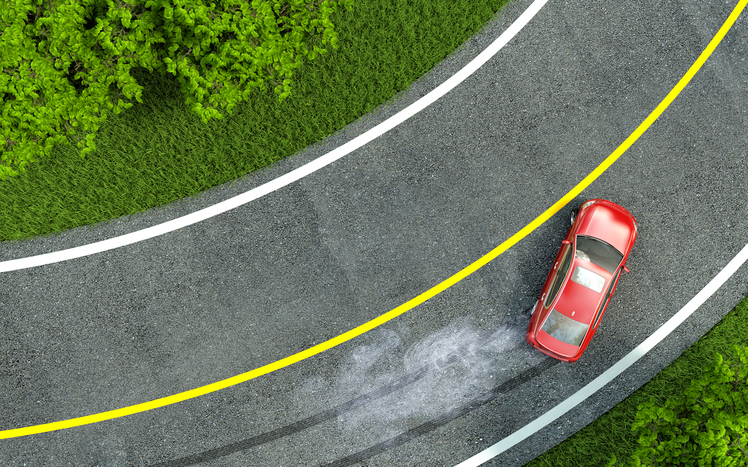 A skid is also a device for locking the wheel of a vehicle or slowing the wheel’s motion when going downhill. Such devices were often used on horse-drawn carriages. Skid dates back to around the year 1600, and originally meant ‘a beam or plank on which something rests.’ It came into English from the Old Norse skið (skith), meaning ‘stick of wood,’ or a similar Scandinavian source, from the Proto-Germanic skid (to divide or split) and the Proto-Indo-European root skei– (to cut or split). It is related to the Old High German skit and the German Scheit (log), as well as the Old English scīd (thin slip of wood), the obsolete English noun schide (a piece of wood split off for timber), and the word ski. The sense of skid narrowed to ‘a beam of plank on which something heavy can be moved’ in the late 18th century. The sense ‘a sliding along’ appeared in the late 19th century, and has been applied to motor vehicles since the early 20th century. Skid mark dates back to the early 19th century as well. The idea of a skid being used to facilitate moving something downhill led to the expression hit the skids (early 19th century) and skid row (1920s). The verb comes from the noun, and dates back to the late 17th century. It originally meant ‘to apply a skid to a wheel’ (to keep it from turning). The sense ‘slide along’ first appeared in the mid-19th century, while ‘slide sideways’ (on a road) is from the late 19th century.